Teaching Jobs in Turkey - Hundreds of Exciting Vacancies Right Now! 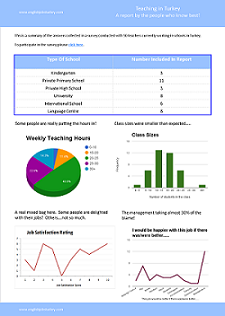 By submitting this form you agree to be contacted by email or text with information about job vacancies and teaching related products and services. You can opt out at anytime by emailing us or updating your preferences in your account profile. Advice about getting a teaching job in Turkey. Strategies for non-native speakers to get hired faster. CV writing and design tips. Ideas for teaching vocabulary and grammar to Turkish students. Discussions about behaviour management issues. Teacher training courses and lesson plan materials. Lots of great jobs. One easy application. Choose from the best online courses. Jobs available all year round. We have a wide range of opportunities from entry level jobs for newly qualified teachers with no experience to highly paid jobs for those with more qualifications and experience. Since 2012, English Jobs Turkey has been working with thousands of applicants each year to find just the right fit for our client schools. We work hard to filter and screen the applicants so you don’t have to. We have an active database of qualified teachers searching for teaching jobs in Turkey. Get updates about teaching jobs in Turkey. PLUS lesson planning tips, reports and news. Well, I am not sure about that Alex but I think a lot of people are going to appreciate the information here. Our aim was to discover the best and the worst teaching job in Turkey! We interviewed a ton of teachers and asked them everything! I asked them all a set of very detailed questions about what it's really like to work where they do. What behaviour management problems do you face? Is there anything weird in the contract? How many hours do you teach? How many Saturday's do you work? And everything else I could think of! Want to know what its like to teach in Turkey? 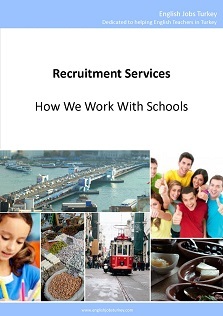 All our knowledge and experience in one results oriented guide book on getting a teaching job in Turkey. Everything you need to know about teaching jobs in Turkey! It's harder than ever to get the number of quality of teachers you need, at the right time. English Jobs Turkey (EJT) works with thousands of applicants each year to find just the right fit for its client schools. We filter, screen and test the applicants so you don’t have to. We know what it takes to be a good teacher because we are teachers too. We also know what makes a happy teacher and how to manage expectations on both sides to ensure the highest level of staff retention. We can tailor our services to your needs. Our job is to narrow the field and present you with the best applicants. GDPR Statement. By entering your contact details in the contact forms on our website you consent to being contacted by English Jobs Turkey and our connected companies.